"The time is now for a digital channel dedicated to people with passion who together create social and economic impact"
FreeTimePays is a digital space for those people who want to make a difference – for themselves, for their families, for their communities and for the things they really care about. 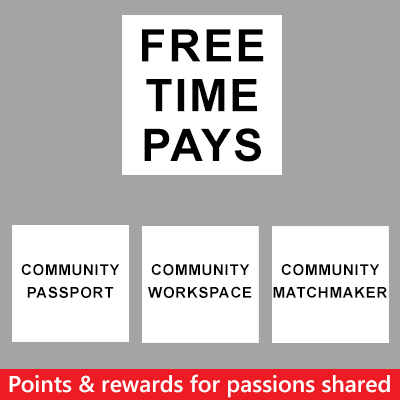 There’s Community Passport; Community Workspace and Community Matchmaker. Operating right across the platform in recognition of the valuable contribution being made by users is FreeTimePays gamification. This takes the form of points and rewards for passions shared. FreeTimePays is here for people who really want to become involved in their community or with their particular passion and for those people who are really serious about making a difference. It’s our job at FreeTimePays to provide the tools and functionality that helps bring together; those who create the great ideas with those who have the potential to turn an idea into something that really does make a difference. Passport is a personal space which registered members can make their own. With a passport, members can choose to get involved with their passion and participate in many different ways. People can register and obtain a Community Passport at a growing number of websites. All of the FreeTimePays sites are being launched from Spring 2017. Together with our partners, our sponsors and our champions, FreeTimePays are planning to promote at least 10 communities and 10 passions every 3 months, and as you would expect, the FreeTimePays App will soon be available. Members looking to contribute and add content are given additional access rights so they can submit posts. Posts can be created on any device and it’s quick and it’s easy to do. Their contribution can be a photo, a video, a poll or a quick survey. It could be news, a ‘Did you Know’ article or something inspirational. A title can be added to the post as well as additional text and links to other documents. Tags can be included, a publish date added and a preferred location for the post selected. Once prepared, it is then submitted. All content that is submitted is viewed and approved prior to publication. And once published, the contributor can sit back and watch others who share their passion respond through likes and further contact. With their unique Community Workspace, FreeTimePays is able help those who are inspired and serious about taking things to the next level. FreeTimePays will give these people their own access rights environment where they can work on their idea or project. In this space people are in complete control with what they store and who they decide to invite in and join them. The FreeTimePays doors are not just for those thinking of running a business or taking a venture forward. For those pursuing their passion on a voluntary basis, there is so much to offer. Whatever the content, whether photos, images, videos, documents, or links to places on the web, people can build their very own protected resource, deciding to share it with others whenever and if ever they feel the time is right. That’s a very brief look at FreeTimePays but there’s so much more to share with you. Let’s arrange a time to discuss things further so we can show you just what together we can achieve and deliver with FreeTimePays. FreeTimePays is a digital space and social media channel for those people who really want to make a difference for themselves, for their families, for their communities and for those things they really care about. The focus of FreeTimePays is on the positive things that can be achieved from the use of social media and the use of digital technology. Dreams and Ideas when shared create impact. FreeTimePays employs social media to deliver social impact and supports the people who really want to make a difference. Our purpose is to turn dreams into reality, aspirations into positive outcomes. FreeTimePays is fun and, most of all, rewarding. Shared passions (rewarded and recognised) deliver positive outcomes. The time for FreeTimePays is now!